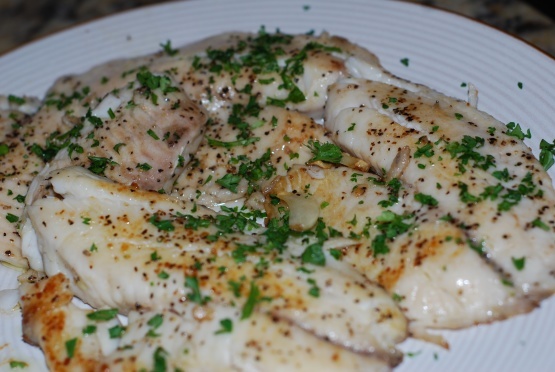 Season tilapia fillets with salt and pepper. Put fillets in first, and when they start to turn color a bit (after 1-2 minutes) add garlic slices. Continue cooking about 4 minutes or so, then flip fillets. Fry until cooked through, and fish flakes easily with a fork– this will depend entirely on the thickness of your fillets, so you will need to watch them carefully. The garlic should turn a dark golden brown, but not be burned, if you notice that the garlic is starting to burn, spoon it over the fish, so it is no longer in contact with the pan. Serve with freshly squeezed lemon juice and garnish with chopped parsley.